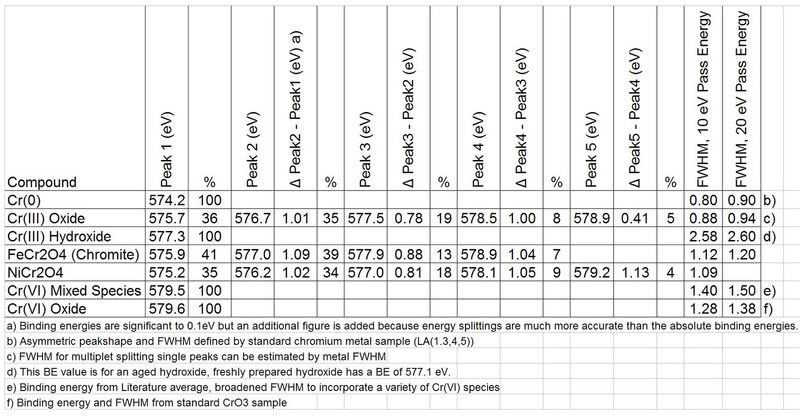 Fitting parameters for chromium 2p3/2 spectra are based on spectra taken from a series of well-characterized standard compounds  (updated and expanded in reference , charge-referenced to C 1s at 285.0 eV in  and 284.8 eV in ). 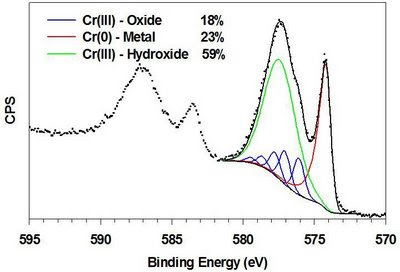 Fitting parameters that can determine Cr(0), Cr(III) oxide, Cr(III) hydroxide and Cr(VI) components were determined and take into account asymmetry in the metal peak, a broader envelope of peaks attributed to multiplet splitting of the Cr(III) compounds and a single peak (no unpaired electrons) for Cr(VI) compounds. Cr(III) species can be further divided into the oxide, which will show discrete multiplet structure, and the hydroxide which shows only a broad peak-shape. The asymmetry in the metal peak is defined here by a Gaussian/Lorentzian product formula modified by an asymmetric form (supplied by CasaXPS software) and is based on spectra from an argon ion sputter cleaned pure metal surface. The FWHM for the metal will depend on the instrument used and should be measured for a particular instrument type. Analysis of the metal peak will also give a good estimate of multiplet splitting peak-widths as the FWHM of the metal peak generally matches that of the individual multiplet peaks under similar spectrometer conditions. Peak-widths for the Kratos Axis Ultra set at a pass energy of 20 eV are around 0.88 eV for the metal and five individual Cr(III) oxide multiplet peaks, while the hydroxide peak is around 2.6 eV. Quantification of Cr(VI) species (single peak at 579.5 eV from average of literature data, FWHM of 1.3 to 1.5 eV to incorporate a variety of Cr(VI) species) is limited by the overlap with the multiplet splitting of the Cr(III) species. This likely raises the detection limits for Cr(VI) in a mostly Cr(III) matrix to around 10% of total chromium. Any contribution attributed to Cr(VI) below that should be treated as “not detected”. An example of this fitting is presented in Figure 1. 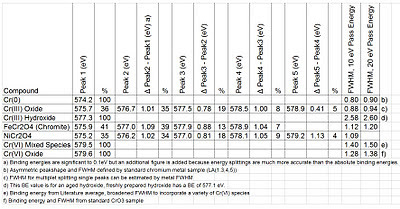 Fitting parameters are presented in Table 1. A CasaXPS ready example can be found here. Fitting parameters for a number of other species (e.g. CrCl3, Cr2S3) can also be found in . Figure 1. Fitting of a Cr 2p3/2 peak for a decorative chrome plated part . Table 1. Curve-fitting parameters for Cr 2p3/2 spectra .